MORE WAYS FOR YOU TO CONNECT. MORE WAYS FOR THEM TO BE PRODUCTIVE. GettingOut provides simple and reliable communication between inmates and their friends and family to increase connections and lower recidivism. Inmates at Pulaski County Detention Center have access to wireless tablets and the “GettingOut” platform, which means you have more ways to stay connected and inmates have more productive and positive ways to spend their time. To create your GettingOut account or to log in as an existing member click here. For help getting started, just follow the steps below. Need further support? Visit our GettingOut Help Center to find FAQs, video tutorials, tips, and more. WHAT DO INMATE TABLETS OFFER? A messaging system that allows messages of up to 300 characters to be exchanged between inmates and verified friends and family members. Friends and family can send messages online or with our free mobile apps for iOS and Android. A photo exchange system that allows verified friends and family to share photos with inmates. Friends and family can send photos online or with our free mobile apps for iOS and Android. The GettingOut platform offers inmates a variety of entertainment content ranging from music to movies to games. Our collection of content is constantly being reviewed to be engaging, and to reinforce a positive outlook and feelings of well-being. 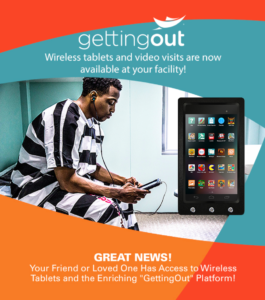 Inmates using the GettingOut platform have access to enriching education content including GED, law library, reentry programs and other facility-approved content to help inmates get out and stay out. In order for inmates to use tablets they must have funds in their Inmate Account. Go to www.gettingout.com and click “Log In” then “Create a New Account.” Once you are verified you can make a deposit. From www.gettingout.com or our mobile app, deposit funds into your Inmate Account. PLEASE NOTE: in order to exchange messages and photos with your inmate you’ll also need funds in your Friends & Family Account. Once inmates have funds in their account, they can turn idle time into more productive time with education, music, ebooks, movies and games! Download our iPhone app or our Android app so you can make deposits, send messages and exchange photos on the go. Visit our GettingOut Help Center to find FAQs, video tutorials, tips, and more.